“Cricket is my favourite sport and I’m so happy that the Life through Cricket programme is giving me a chance to play this match with all my friends. We are learning to be a team and have lots of fun. I wish they continue this in the future,” said Chirantha Wijesuriya, a child of the Rainbow Centre at the MJF Centre in Moratuwa, while attending the Life through Cricket – Cricket Carnival at the De Zoysa Stadium in Moratuwa. 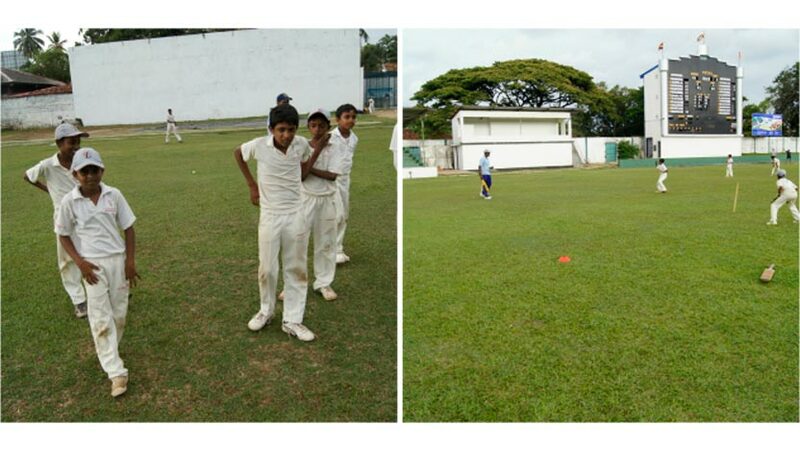 Chirantha and many of his friends from in and around Moratuwa took part in a mini cricket carnival organized by the New Zealand Cricket Live Foundation (CLF) and the MJF Charitable Foundation (MJFCF) from 28 – 31 July 2014. This event was part of a wider programme encompassing the second phase of the Live through Cricket initiative. ‘Life through Cricket’ is a joint venture between the MJF Charitable Foundation and the Cricket Live Foundation directed at training cricket coaches in and around Moratuwa and, through them, providing cricket coaching for underprivileged children who are keen on progressing through cricket. It also provides an opportunity for selected players to revisit the programme in another capacity as a coach, mentor and/or administrator. The Cricket Live initiative is strengthened by five core values; respect to family and friends, nutrition and healthy living, self discipline, team work and, punctuality and time management. The project which commenced in January 2014 with a cricket coaching clinic continues with quarterly reviews and bi-annual educational and practical training sessions conducted by coaches and former cricketers from New Zealand and a select panel from India and Sri Lanka. The second phase of the programme saw underprivileged children and their differently-abled peers taking part in a four day cricketing event comprising daily matches, music, dancing and a host of games aimed at team building, personality and confidence development, and promoting life skills, followed by a certificate award ceremony held at the MJF Centre in Moratuwa,. Thereafter, a second coaches training programme, addressing educational and practical aspects of cricket targeting 30 individuals, was conducted by the Life through Cricket Team. In Sri Lanka, cricket goes beyond the role of sport, connecting cultures and ethnicities across the island. It often serves as the hope and future of many youth from disadvantaged backgrounds who dream of becoming professional cricketers one day. Dilmah gives such children an opportunity to pursue their passion by offering them proper guidance, training, facilities and encouragement with a solid foundation. This venture is aimed at supporting children who live in underprivileged environments to develop their skills not only as cricketers, but as young individuals. Because the success of these players and their development is determined by the capabilities of the coaches and the environment they create, the coaches themselves need to be able to relate with the players and serve as inspiring role models and guides. Due to this reason the coaches in the programme have also been selected from similar backgrounds to the children. The MJF Charitable Foundation provides all financial and logistical support for the selection and retention of local coaches, selection of local children, the coaching programme, development of the outdoor cricketing nets at the De Zoysa Stadium at Moratuwa and the extension of the programme to the areas outside of Colombo. In order to ensure facilities for continuous training immaterial of adverse weather conditions the MJFCF also undertook took to refurbish the indoor cricket training nets facility at the De Zoysa Cricket stadium recently. Ramesh Sanjeewa, who has a special knack for the game hopes that Life through Cricket will become a continuous addition to the MJF Kids Programme of the MJFCF. “I have been a part of the MJF Kids programme for over two years now. The Life through Cricket Programme has given me a chance for a better future without discrimination -of age or of social status- and I feel privileged to be a part of it. Teamwork, leadership and self confidence are just some of the skills I have acquired through this event. I am very hopeful about the opportunities that this initiative will create for kids like me,” he says. The Founder of the Cricket Live Foundation in New Zealand, Alex Reese also joined the second phase of Life through Cricket Programme, along with a team of former cricketers, coaches and trainers from New Zealand comprising Ryan McCone, Matt Parr and Richard Taylor. The team played a key role in training the children and the coaches in both theoretical and practical sessions. Alex established the Cricket Live Foundation, New Zealand to give all Sri Lankan children who love cricket a chance to become stars of a game they loved, despite being from marginalized communities and disadvantaged backgrounds. The Sri Lankan school is the foundation’s first, with New Zealand cricketers, qualified players and coaches, secondary cricketers and volunteers determined to make positive change in the lives of the individuals benefitting through the initiative. “We are not just looking to change the lives of these kids by giving them an opportunity to train and practice. We want to develop their life skills and see them better themselves in all aspects of their lives. We have seen such improvement in the children, both on and off the field. Even the response and support of the parents have been amazing. It’s a win-win situation for everyone,” Alex explained discussing the vision for Life through Cricket. “We want to create career opportunities and encourage the coaches of the program to become true professionals. The MJFCF will be employing a number of individuals from the programme to serve as coaches to the kids who attend it. We have also spoken to many organizations, academies and schools from around the area and they too are willing to employ the coaches who have trained under the Life through Cricket Programme. That will create more employment opportunities for them. This is what we want, for those involved to truly benefit from the programme; to change their lives for the better,” he added. Alex also mentioned that it was the dedication of the Fernando Family and the MJF Charitable Foundation to this cause that encouraged the first CLF School to be established in Sri Lanka. “With their help, we want to expand this initiative and take it to the rest of the island, to touch the lives of more children and those who love cricket,” Alex says.